Most canines love car rides, but did you know lots of dogs also love hogs. 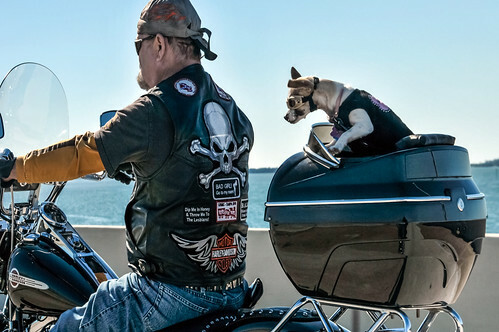 Why, there’s even a biker “gang” of dogs that travel together in Craven County, North Carolina. The riding group’s pups, which include a dachshund, a poodle and a Chihuahua, enjoy nestling on the back of their owners’ motorcycles and cruising the open road. If your dog’s ears perk up when you start your motorcycle, maybe it’s time to see if your buddy also wants to become a biker. With a variety of dog-friendly transportation options on the market today, your furry friend could soon be enjoying roaring down the highway with you. Not every dog is going to enjoy motorcycle riding, so don’t force a reluctant pup onto the back of your bike. Some canines will find the noise too much for their sensitive ears, while others will not enjoy the sensation of having large trucks rumble up alongside them. If you know your dog tends to be on the timid side, biking may not be a good option for him. Your dog is important to you—make sure he’s safe during the motorcycle ride to prevent any accidents or injuries. Carrier Bags: Several types of carrier bags are available on the market. These types of bags are typically designed for smaller dogs, 20 pounds or less, and mount behind the rider. Harness and Sidecar: For larger dogs, your best option will be a sidecar and a harness. Design your own system or purchase one straight from the manufacturer such as the Motorcycle Trike Pet Carrier. 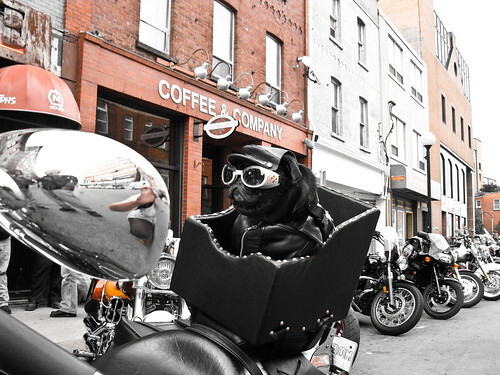 Riding Accessories: Have your dog wear a doggy motorcycle jacket such as the “Born to Ride” model available from The Pet Boutique, and look even cooler by matching your dog with one of the motorcycle jackets from BikeBandit.com. Lastly, don’t forget the doggles (doggy goggles) to protect their eyes in the wind! There are also other options, including front carrier bags and saddlebags, on the market as well. If you will be using a carrier, get your pup used to sitting in it on the ground first. Next, place the carrier and the dog on the motorcycle so that he can get used to the feeling of being on the bike. Start the bike and gauge his reaction. Does he seem scared or okay with the situation? Don’t take your dog on the road until he seems relaxed in the carrier or in the sidecar—a frantic, scared dog could compromise the safety of both you and your pet. It is important to take a few short test rides around your neighborhood before going any long distance from your house. Even after the first few times, make sure to stay local until you are positive your pup will be fine with cars and trucks roaring all around him. Once you’re sure your dog is comfortable on the bike, it’s time to take him for a longer adventure, but remember that you should stop several times to give your dog a chance to stretch its legs and relieve itself. For these longer trips, don’t forget to pack a leash, a tie out, some plastic bags and a collapsible water bowl. to the right on my seat, as I will be the passenger, for my JRT. Room for a carrier that can be taken out and used in the motel room. The compartment has two lids, large (to put him in and out of it) and small, so he can look out, if he wants. If he is laying down sleeping it can be shut also. He will still get some air, its not air-tight. Have his goggles ready, he does not like them, only wears them for a little while. But I am hopeful. When it gets done, I will let him sit in it off and on without starting the trike and let him get use to it. He is pretty good about staying where I tell him too. He rides around in my garden cart all the time without jumping out and in our convertible he is on a leash. He will have a harness seat belt on the trike also. I am not sure he will like it at all. I hope so, I do not like boarding him, or leaving him with pet sitters. If he hates it then we will have extra storage on the trike! Anyone take there dog on a V8 trike, or similar?